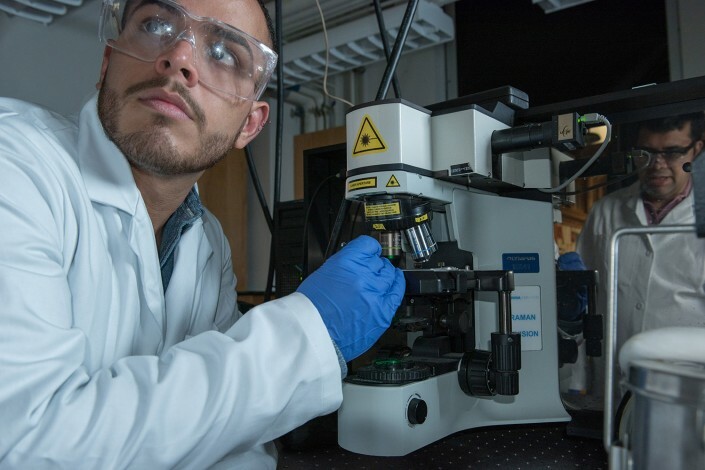 An international team led by a Texas A&M University chemist is taking science one step closer to building a better battery, thanks to new research published today (June 28) in the journal Nature Communications. Their research has the potential to create more efficient batteries by shedding light on the cause of one of their biggest problems – a “traffic jam” of ions that slows down their charging and discharging process. All batteries have three main components: two electrodes and an intervening electrolyte. Lithium ion batteries work under the so-called rocking-chair model. Imagine discharging and charging a battery as similar to the back-and-forth motion of a rocking chair. As the chair rocks one way, using its stored energy, lithium ions flow out of one electrode through the electrolyte and into the other electrode. Then as the chair rocks the other way, charging the battery after a day’s use, the reverse happens, emptying the second electrode of lithium ions. Using one of the world’s most powerful soft X-ray microscopes – the Scanning Transmission X-ray Microscope – at the Canadian Light Source in tandem with decades of combined experience in materials science, Banerjee and collaborators from the Lawrence Berkeley National Laboratory, Binghamton University and the National Institute of Standards and Technology were able to image a traffic jam of lithium ions chemically driven through the nanowire-based channels of a simulated battery. Banerjee points to this interruption as a veritable ghost in the machine that not only slows everything down but also sometimes prevents the device – be it a cell phone or a laptop computer – from exploiting its full battery potential. He says the devil is in the details, which in this case clearly show that the electrons, once coupled with the lithium ions, appear content to sit instead of moving freely, thereby distorting the electronic structure and, in essence, trapping or stranding the flow of energy.